Both Novices and Pro's all over the world find something interesting in any one of the nautical charts. 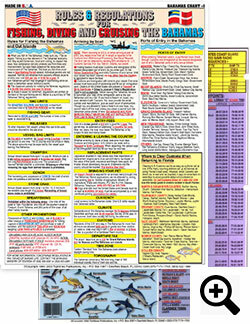 Tightlines Nautical Charts also can be found in the New (I.G.F.A.) International Game Fish Association Museum and Library in Dania Beach, Florida. All nautical charts are 3mm Laminated to ensure 100% percent Waterproofing, and can be rolled up to fit into any tackle box. 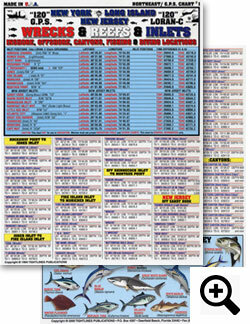 Tightlines Publications is proud to announce that they are the Leader in Fishing, Marine, Nautical, and Navigation Charts. From Boating to Plotting a course on the open seas, you can't go wrong with a Tightlines Nautical Charts at your helm. North East GPS & Lorans -C Chart #1 - 120 G.P.S. and Loran-C Coordinate's for Inshore & Offshore, Plus all of the canyon's Locations, Including all of the New York Inlets from Romer Shoal's Light House, to Montalk Point Inlet and all Inlet's in between. Chart also includes all of the following: and so much more. Rules of the Road #1. 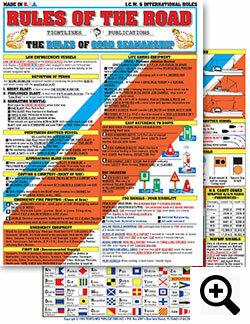 (Inter-Coastal & Intl) Nautical Flag Single's, Mayday Signal's, Law Enforcement I.D., Fog Signal's, Definition of Sound Signal's, Overtaking Another Vessel, Approaching Blind Curves, Caution & Courtesy, Emergency Fire Fighting, Class of Fire's, Emergency Equipment, First Aid and so much more. RULE'S of the ROAD #2. 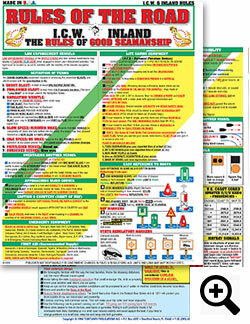 (Inter-coastal & Inland) Law Enforcement Vessel I.D., Definition of Sound Signal's, ( Proscribed Blast - and there Meaning's ), Overtaking another Vessel, Approaching Blind Curve's, Caution & Courtesy (Right of Way), Emergency Fire Fighting, (Class of Fire's ), Emergency Equipment - and so much more. FLORIDA: Central & S.E. 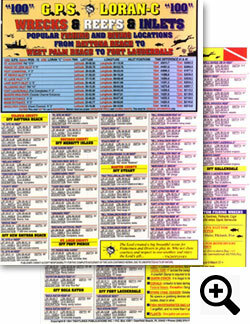 Coast Chart #4 Wreck's / Reef's / Inlet's : 100 G.P.S. & Loran-C Coordinates, from Daytona Beach to West Palm Beach to Ft. Lauderdale. Chart includes all inlet's from St. Augustine to Anglefish Creek in Key's (Hawk's Channel), And All inlet's in between in both G.P.S. & LORAN-C, and much more. 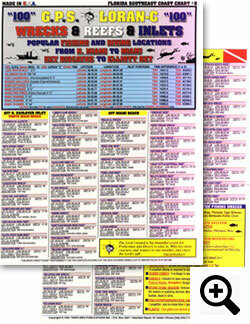 FLORIDA: Southeast Coast Chart #5 Wreck's / Reef's / Inlet's: 100 G.P.S. & Loran-C Coordinates from North Miami, to Miami, Key Biscayne, to Elliott Key. Chart's include all inlet's from Lake Worth inlet, to Hawk's Channel Buoy # R 44 Marker and all inlet's in between in both G.P.S. & Loran-C and so much more.